If Christopher Reeves' Superman was one of my most mind-blowing movie experiences as a kid from a heroic perspective, Darth Vader had to be his evil twin. I'm not sure what it was about him that made me an instant fan; that steady calm or the ability to choke the hell out of whoever disagreed with him - all I know is when I heard that asthmatic breath, even Noah screaming 'He's flooding the earth again' on the front lawn could've pulled my attention away. If only (sigh) he hadn't become a hero in the end. Sure, that's the 'Oprah' method, but in my mind Return of The Jedi ends with a Vader roasting both Luke and The Emperor, then Stormtroopers selling Jedi/Sith Lord sloppy joes from a Death Star burger chain, funding Vader's efforts to fillet the universe. But I digress. Point is Vader was the ultimate evil, and not only should he never have reverted, he should've had his own film. 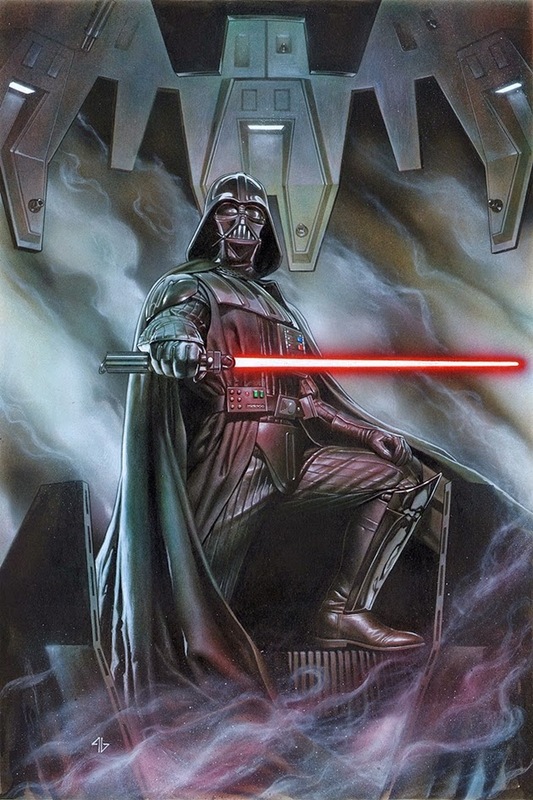 The last part Marvel obviously feels too, as they have announced Star Wars: Darth Vader will be one of the lead titles in their Star Wars range, written by Kieron Gillen, drawn by Salvador Larroca, with covers by fellow iconic Iron Man artist Adi Granov. Launching in February 2015, after January's debut Star Wars (by writer Jason Aaron and artist John Cassaday), and prior to March's Star Wars: Princess Leia (from writer Mark Waid and artist Terry Dodson), Darth Vader will follow ol' Vades regaining control of the Empire, after he choked saving the first Death Star from Rebel scum. Princess Leia will be a five issue mini-series of the sister/girlfriend/R2D2 hologram floozie dealing with the destruction of her homeworld, Alderaan (maybe it's her that needs the Oprah moment), and the alleged 'core' title (at least for non-Vader fans) will deal with the Rebels fighting the after effects of destroying the first Death Star. Worst after effect in the world: marriage. Don't say IADW isn't educational.